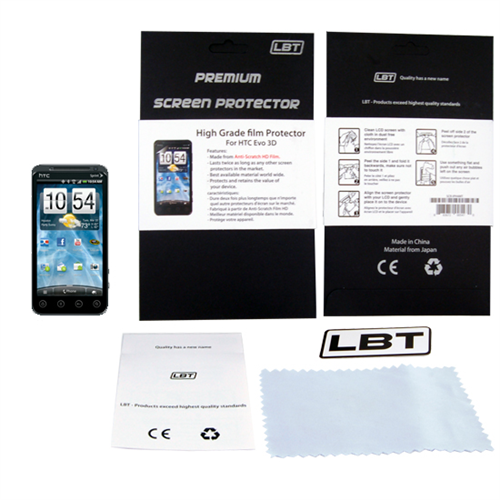 &nbsp;&nbsp;&nbsp;&nbsp;&nbsp;&nbsp;&nbsp;&nbsp;&nbsp;&nbsp;&nbsp;&nbsp;&nbsp;&nbsp;&nbsp;&nbsp;&nbsp;&nbsp;&nbsp;&nbsp;&nbsp;&nbsp;&nbsp;&nbsp;&nbsp;&nbsp;&nbsp;&nbsp;&nbsp;&nbsp;&nbsp;&nbsp;&nbsp; LBT HD 3D&nbsp;Screen Protector for HTC EVO &nbsp; Our LBT High Definition Screen Protectors are made from the highest film grade quality available worldwide. It enhances your phone’s viewing pleasure by intensifying its colour and vibrancy. You have not truly seen your screens display capabilities unless you have seen it with one of our screen protectors applied. Unlike other screen protectors, our LBT HD screen protectors allow heat to escape through the LCD as to not overheat your device. * Available for all the most recent and popular devices Includes: - Protects LCD from scratches, finger prints and dents&nbsp;&nbsp;&nbsp; - Manual - Dust grabber and scratch card -Value Pack 2 Screen Protectors Included -- Libratel Inc.
Our LBT High Definition Screen Protectors are made from the highest film grade quality available worldwide. It enhances your phone’s viewing pleasure by intensifying its colour and vibrancy. You have not truly seen your screens display capabilities unless you have seen it with one of our screen protectors applied. Unlike other screen protectors, our LBT HD screen protectors allow heat to escape through the LCD as to not overheat your device.